Arktika is the only branded train on Moscow - Murmansk direction. The train appeared in the Soviet time, and now runs daily from Moscow to Murmask with a stop in Saint Petersburg. The train was renovated in 2010. 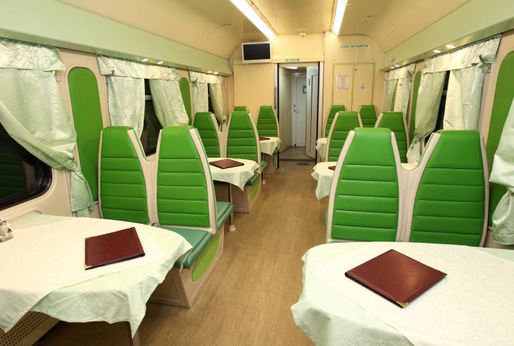 The train is equipped with bio toilets and air conditioning in each carriage. Second class also known as coupe carriage consists of 9 separate quardruple compartments with four bunks (2 lower and 2 upper), a fold-down table and a sliding door. Among other amenities are personal reading lights, storage space (built-in shelves over the door, boxes under the lower bunks, racks on the wall beside each bunk). A standard compartment in a superior carriage. Seats: 2 lower and 2 upper berths 70 cm wide. Berths arrangement (number): 2+2. Included service: meal, hygienic kit, printed press. Carriage: 8-10 compartments, a/c, bio toilets. A standard compartment. Seats: 2 lower and 2 upper berths 70 cm wide Berths arrangement (number): 2+2 Carriage: 8-10 compartments, a/c, bio toilets. Third class, also known as platskart, is the cheapest option on long-distance trains. The open-class carriage consists of 54 bunks, arranged in bays of 4 on one side and bays of 2 on another, with an aisle between the two sides. The side bunks are over and under the window. 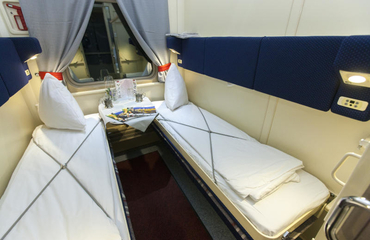 When the passenger is not sleeping, lower side bunk transforms to a table and two seats. open-plan carriage with couchettes; capacity: 52-54 berths; facilities: a/c, bio toilets. 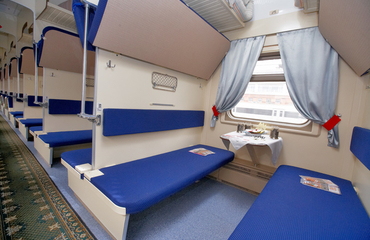 open-plan carriage with couchettes; capacity: 52-54 berths; facilities: a/c. The cabin consists of two bunks and a folding table. 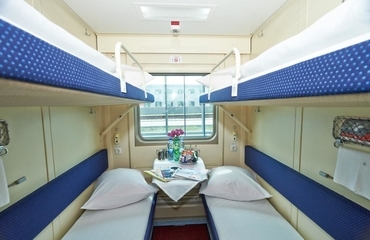 Usually both bunks are lower, but some trains have compartments with one lower and one upper bunk. Other amenities of the compartment include personal reading lights, storage space under the lower bunks and a sliding door. Usually there is also a mirror and in some trains - a wardrobe and sockets. Capacity: 2 persons. Facilities: 2 berths, a folding table. Included service: meal, hygienic kit, superior linen. Carriage: superior; 8-10 compartments, a/c, bio toilets. This train supports electronic registration. It means that a ticket which you receive by e-mail is already valid; a passenger should just print it and show on boarding along with the passport.